Previously, in the era when my typing callouses were just a little bit smaller, we had only a test track: a plain piece of evolving art that I kept moving walls around on to test various widths and radiuses of pavement and to see just how much I could annoy people with various wall setups. Now, alas, I have moved beyond a single hard-coded test track and written the features to manage and cycle through a collection of tracks for the primary racing mode, Championship Racing. During this time, track design and art was also started in earnest by Brooks and I. Thus, between all that and getting bogged down in businessy stuff, a devlog update has been a long time in coming. But, it was worth the wait, I thinks. 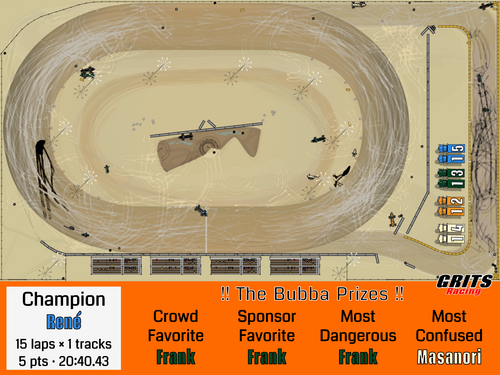 Our first headed-for-production track is a desert loop based on a dirt track here in New Mexico. In testing it, I was honestly surprised at how much fun it was to finally get off the test track and drive yet another loop track -- I mean, how different can one loop really feel from another loop? You see, in my theoretical mind, there is only so much variation we can provide on a single screen with the current tech built into the game, so I was not expecting to feel a whole lot of difference from track to track even though I've been building for a decent array of surfaces and colliders -- and tried to push the desert loop as different as I could without getting silly about it. Thus, I find it encouraging to have enjoyed testing the desert loop this much. In other news... also during this time, came the launch of the new Atari VCS on Indiegogo. I couldn't resist taking some time to blog my complex feelings about it. You can find that here: The new Atari what? It is relevant because it is a possible target platform.